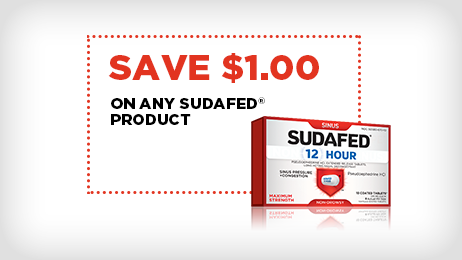 All products from the makers of SUDAFED® contain a nasal decongestant, either pseudoephedrine or phenylephrine. These medicines act on the nasal passages to narrow blood vessels that are causing nasal congestion. When the blood vessels in the nose and sinus region narrow, tissue shrinks to allow the normal flow of air and mucus. Decongestants act on the nasal passages to narrow blood vessels in the nose and sinus region that cause congestion. Tissue shrinks to allow the normal flow of air and mucus. This nasal decongestant is found in the original formula of SUDAFED®, now found at the pharmacy or service counter. To better insure that medications containing pseudoephedrine are not used to illegally make methamphetamine, all products containing this ingredient are federally regulated. For more information, see Pseudoephedrine regulations. This nasal decongestant is found in SUDAFED PE® products and can be found in the cold and allergy aisle. PLEASE VIEW THE DOSAGE INFORMATION FOR ALL OF THE MEDICINES ON THIS PAGE.